In the end, AzhwAr says “Those who learn this decad will be praised with ‘thiruppallANdu’ by beautiful-faced damsels”. emperumAn, having a very wonderful lion form, set out towards the enemy hiraNya, the demon, and tore his body and became pleased due to effortlessly eliminating prahlAdha’s enemy; nammAzhwAr, leader of AzhwArthirunagari, mercifully spoke about such emperumAn who is having the divine disc which is part of his beauty and wealth, in this decad, among the distinguished thousand pAsurams which are having greatness of presenting the qualities and activities of bhagavAn clearly; those who are able to practice this decad will be performed mangaLASAsanam by “madhi muga madandhaiyar” who are servitors of bhagavAn and are eager to serve bhAgavathas and be served with chAmara (fan) etc. pukka ari uruvAy – avvari uruvAy pukku. We can only say “avvari uruvu” (that lion form) [it’s beyond description]. Assuming the human-lion form and entering into the place of the enemy. Alternatively – the fierce anger with which emperumAn tore and moved forward. Instead of someone from outside doing that, it appeared as if a lion came out of hiraNya’s body tearing it apart; AzhwAr is speaking about that. avuNan … – After tearing apart hiraNya’s body, emperumAn became pleased thinking “the enemy of the child is gone”. sakkarach chelvan thannai – As hiraNya’s body could only partly satisfy the divine nail [which is an incarnation of sudharSana chakra], it was only present for adding beauty. kurugUr … – Those who learnt this decad among the thousand pAsurams which are mercifully spoken by AzhwAr, which reveal bhagavath vishayam fully. thokku … – As people will enter flood waters in a group instead of entering alone, madhi muga madandhaiyar (beautiful-faced damsels) will perform mangaLASAsanam saying “poliga, poliga”, and serve in a distinguished manner just as they will serve sarvESvaran, to those who practice this decad. They will be praised so much that they will be relieved of the sufferings which they went through in this samsAram since time immemorial. 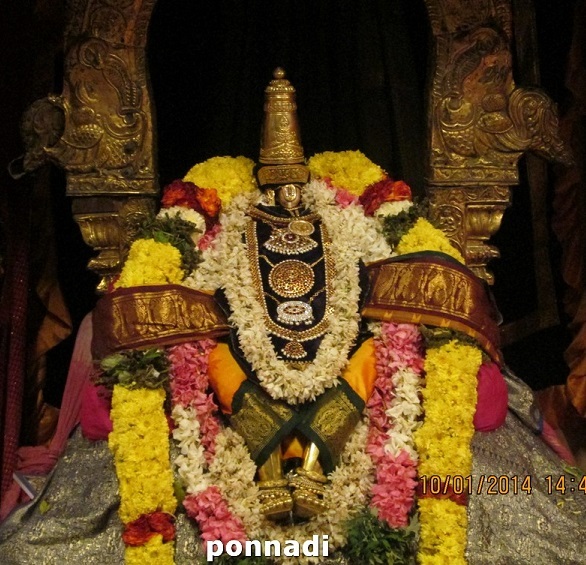 This entry was posted in thiruvAimozhi, thiruvAimozhi 7th centum on October 5, 2018 by Sarathy Thothathri.